While data from provincial authorities has shown faster growth in the second quarter of this year, infrastructure investment will remain a key tool for local governments to keep their economies stable in the second half, experts told the Global Times Monday. As of Sunday, 26 out of the country's 31 provinces, municipalities and autonomous regions had released their first-half GDP figures, with 24 reporting a rise in growth from the first quarter. The only exceptions were East China's Shandong Province and Anhui Province, which both registered identical first-quarter and first-half GDP growth numbers. Economic growth in the central and western areas was more impressive than in the eastern coastal regions. So far, Southwest China's Chongqing Municipality and Guizhou Province are the only two regions to have reported double-digit GDP growth for the first half, with growth rates reaching 11 percent and 10.7 percent, respectively. There are two main reasons behind the faster growth in western China, according to Li Youhuan, a senior economist at the Guangdong Academy of Social Sciences. "First, the local economies are generally smaller than their eastern counterparts," he told the Global Times Monday. "Second, the central government has conducted a lot of infrastructure investment in western regions, in an effort to rebalance the regional economies." South China's Guangdong Province saw growth of 7.7 percent in the first half, while East China's Zhejiang Province and Shanghai Municipality reported growth of 8.3 percent and 7 percent, respectively. 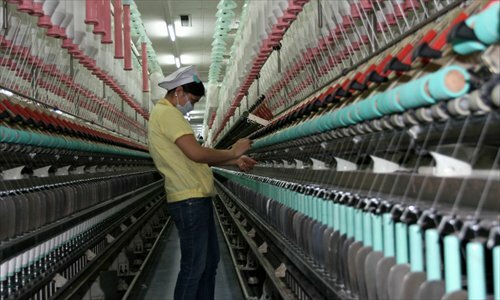 Although growth figures in the coastal areas were not hugely impressive, local industrial structure in those areas has been greatly improved, and local governments' efforts to push forward with structural transformation are starting to pay off, Ye Hang, a professor at Zhejiang University College of Economics, told the Global Times. For instance, the services sector contributed the largest proportion of GDP in Zhejiang Province, reaching nearly 65 percent in the first half, an increase of 12.1 percentage points compared with the same period in 2014. Meanwhile, Northeast China's Liaoning Province reported GDP growth of 2.6 percent in the first half, the lowest nationwide as of Sunday. Southwest China's Tibet Autonomous Region, North China's Shanxi Province and Inner Mongolia Autonomous Region as well as Northeast China's Jilin Province and Heilongjiang Province have yet to release their first-half GDP data. Despite the generally faster growth, provincial-level governments are aware of the potential for substantial downward pressure in the second half, as the recovery "still lacks a solid foundation," the Shanghai Securities News reported Monday. In order to ensure stabilized growth in the second half, local authorities will continue to focus on investment, especially infrastructure investment, the report said. Southwest China's Sichuan Province said that it is planning several major industrial and infrastructure projects, while North China's Tianjin Municipality said it will continue the good momentum in the first half by accelerating project construction. Analysts said the need to maintain such projects reflects uncertainties in the economic outlook for the second half. "It usually takes three to six months for infrastructure investment to have an impact on economic growth, so it is necessary to take some measures such as planning for more infrastructure investment, to ensure growth remains stable," Ye said Monday. China is working on transforming its investment-driven economy into one based more on consumption, but this cannot be achieved in one day, according to Li. "During the transition process, appropriate investment is still crucial for ensuring steady economic growth and a stable social environment," Li noted.